Ponden Home, the soft furnishings and accessories retailer, has opened a new shop in Gateshead town centre, taking the unit in Jackson Street that had been empty since Bonmarche closed down a year ago. Though the letting to Ponden Home had been rumoured since before Christmas, the speed of the store’s opening is impressive. 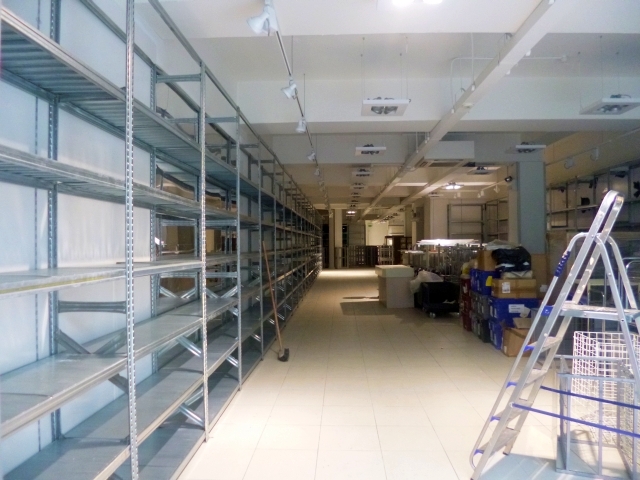 Just this time last week the shop was starting to be fitted out (below), but there was no indication of when the store would open or even what it would be; four days later, on Thursday (14 February), it was trading. Visiting the store today, it’s easy to see how Ponden Mill’s choice of shopfit facilitates a speedy setup. The simple perimeter steel racking, though rather industrial looking by itself, is softened once it’s stacked with sheets and curtains and has a wooden fascia applied to the front columns. Bold but attractive instore signage, printed on cardboard, is also integrated with the racking system, so can be quickly installed and moved as necessary. Overall, then, it’s an inexpensive shopfit, but one that’s visually pleasing and shows off the products to good effect. 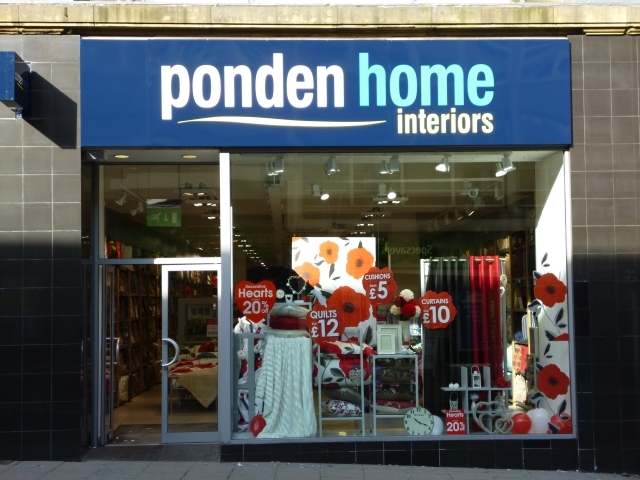 The retail geeks among you will have immediately realised that Ponden Home is part of the Edinburgh Woollen Mill Group, which also owns the fashion chain Peacocks since it bought it out of administration a year ago. Gateshead’s Peacocks, you may recall, was not among the 395 stores that were initially saved; however, EWM Group reopened it four months later. Reflecting the fact that Bonmarche and Peacocks were previously under the same ownership, the units were originally developed (out of the old Co-op department store) with shared back areas and stockrooms, so EWM’s decision to take back the ex-Bonmarche unit for Ponden Home makes good sense. It’s also a welcome vote of confidence in Gateshead town centre, and suggests that the reopened Peacocks store is trading satisfactorily. Ponden Home, meanwhile, with its product mix of curtains, bedding and cushions, is a welcome and useful addition to the town centre’s retail offer. Perhaps more importantly, the letting of an existing town centre unit to Ponden Mill bodes well for there being a further halo effect when the first phase of Gateshead’s Trinity Square scheme opens on Monday 20 May this year. 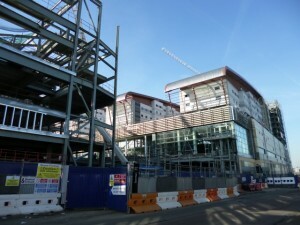 With 240,000 sq ft of new retail and leisure space, the £150m project would be a major scheme at the best of times; as it is, it’s one of only a handful of large-scale UK retail developments to be completing in 2013, alongside a select band of others such as the (unrelated but similarly named) £350m Trinity Leeds scheme from Land Securities. 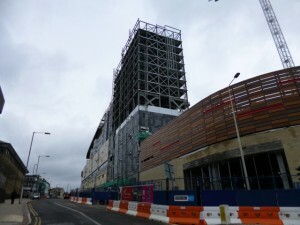 Despite Trinity Square’s scale – comprising a Tesco Extra, 41 other shops and leisure units, a 993-bed student village, and a nine-screen Vue cinema – anyone outside the North East could be forgiven for knowing little or nothing about the project, given the relatively limited national coverage of the scheme, even in august industry publications such as Retail Week. Perhaps the project lacks the glamour associated with schemes elsewhere? 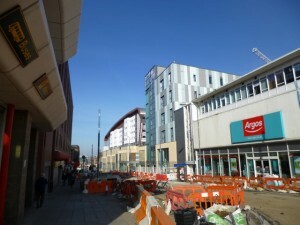 After all, it’s being developed by Tesco’s own regeneration arm, Spenhill, and its list of confirmed retail lettings to date – Greggs, Ladbrokes, Costa Coffee and Phones 4U – is hardly the stuff to set pulses racing, even if the latter two are long overdue new arrivals in Gateshead town centre. Even with a further 12 units shown to be ‘under negotiation’, having all the retail space let and ready for trading by 20 May seems like a big ask, though there seems little doubt that it will fill up once the cinema (opening, I suspect, a little later in 2013) and student accommodation (opening in September 2014) come on stream. It should be worth the wait, though: it’s hard to imagine where else an investment of this scale in Gateshead town centre would have come from, and there’s no doubt that the project will begin to have a transformational impact on Gateshead town centre – not just in terms of its retail and offer, but also in terms of leisure, housing and the overall nighttime economy – as successive phases open. Indeed, while people outside the region may be unaware of Trinity Square, those of us who live or work nearby can hardly miss it – the scale of the development is truly astonishing. 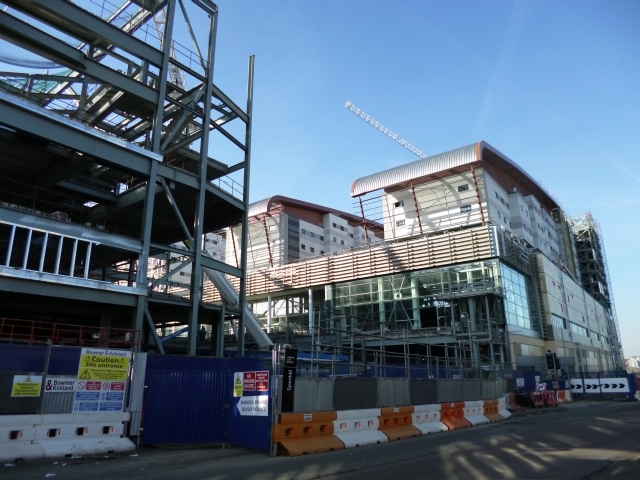 On West Street, the frontage facing the existing Wilkinson-anchored Interchange Centre is more or less finished, while complementary work to improve West Street’s public realm is currently underway. This should help avoid a scenario where the benefits of Trinity Square end at the development boundary. Meanwhile, on the High Street side, the steelwork for the new cinema is largely in place while the massive Tesco store is gaining its glazing and cladding. Apart from the names confirmed to date, I believe at least several existing Gateshead retailers are looking to move from their existing locations into Trinity Square. While this may generate some unwelcome short-term voids, my expectation is that surrounding streets will get a longer-term boost from the town’s improved standing as a retail and leisure destination, encouraged by the scheme’s physical connections to the surrounding streets. 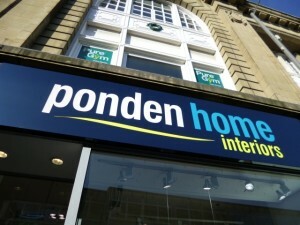 Ponden Home, hopefully, will be just the first of many interesting new arrivals on Gateshead’s established retail pitches as Trinity Square makes its impact felt during 2013 and beyond. My retail consultancy business, CannyInsights.com, provides bespoke place- and sector-specific market intelligence, including detailed coverage of the North East. It also works with retailers nationwide to improve their stores, customer communications and market knowledge. For more information, visit www.cannyinsights.com, drop me an email, or give me a call on (0191) 461 0361. Rescued for the fourth time, can Ethel Austin really have a future? Yeah just got the latest trinity square brochure through, can email to you if you’d like a look? Isn’t Discount UK part of the same company? Just hoping the landlords for the empty properties act to refurbish units so there is a greater chance of letting them? Discount UK is Pound*world*, so it’s quite possible they’d be looking to open in Gateshead too. I’ll send you my email address! It looks like Woolworths Gateshead is going to be one of those empty units for relocation with Poundland confirmed for Trinity Square along with CEX, Sports Direct confirmed and subway relocating from Jackson Street. So vacant units guessing the Ladbrokes on West Street, Subway Jackson Street, Poundland High Street. Thanks Darren! I’d heard that unofficially last year, but this is the first time it’s been confirmed – assuming you’ve seen it somewhere in the public domain! 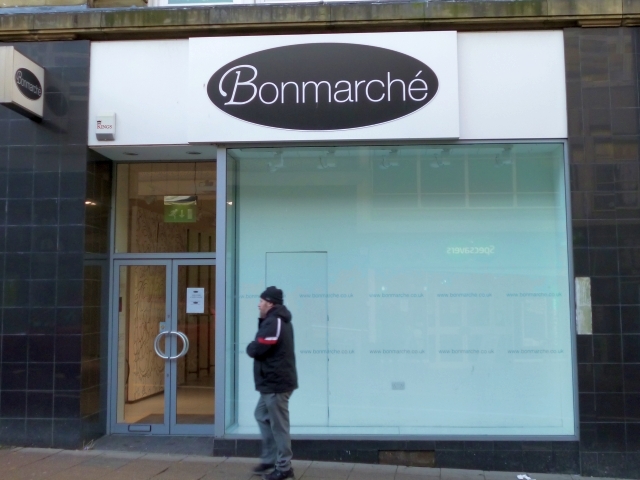 It’s a good unit, though (more so once Gateshead town centre gets its footfall boost from the new development being open) so I wonder if B&M or Discount UK might be tempted? 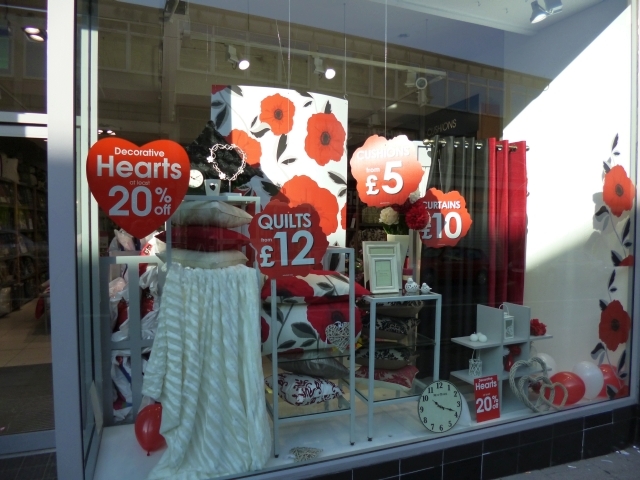 Boyes takes over Bishop Auckland’s old Woolies – could more follow?